Our introduction to Croatia has been very fine indeed. 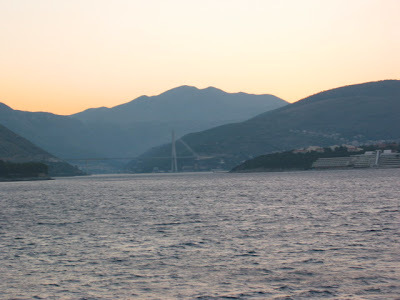 We arrived early into Dubrovnik and took this photo as the sun was about to rise over the city. 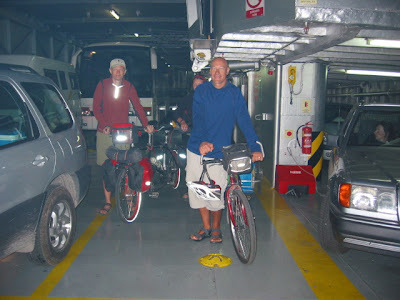 On the ferry from Bari we were excited to meet another lovely tandem couple - a father and daughter from Slovenia. It was great to hear about their trips - they have been away every year for the last 5 years for about 3 or 4 weeks each time. 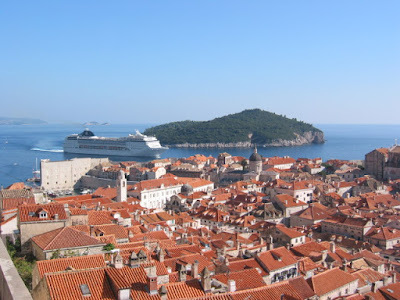 The second photo is getting off the ferry at Dubrovnik. 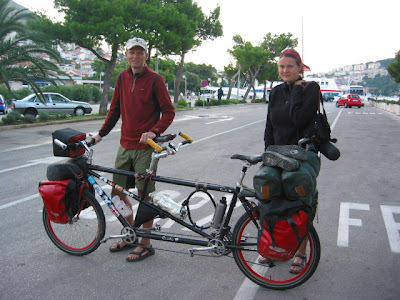 Here is a better photo of Mitja and Veronika with their tandem. Unfortunately we couldn't do any riding together as we were staying a night in town and they were heading off. 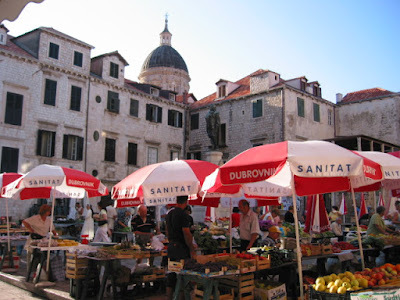 The next photo is the morning market in Dubrovnik's Old town. 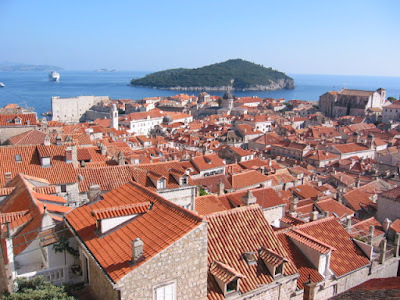 We were able to circumnavigate the walls of the old town on foot - you'll see the fine display of red roofs, most of which are new since the war. 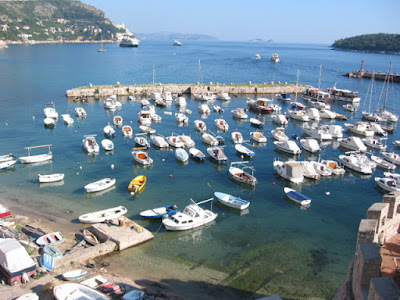 There seem to be many cruise ships coming into D and you'll see one in the next photos - moored and then leaving . . . 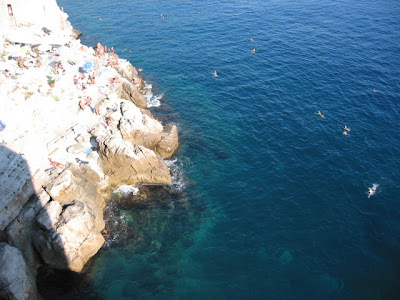 The water is lovely around the city - see the people swimming off the rocks in the crystal clear water. 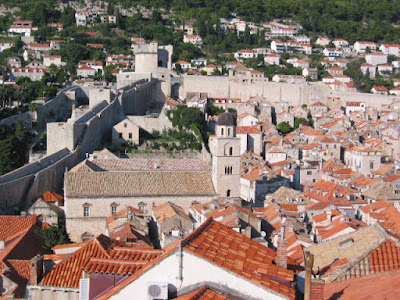 The next view is of the highest part of the Old Town walls. 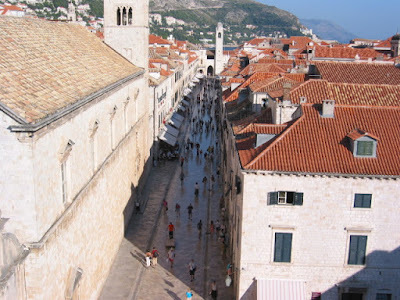 And the last is the white marble main street of the Old Town - no cars are allowed so it is fun to roam around , provided you're not there at the same time as a cruise ship has just arrived!!! !